I’ve been doing it wrong all these years! LOL! I love it! Can I send it to Facebook??!! Thanks for sharing, Stephanie. Hi Fiona, Yes, isn’t it a relief to finally know what the problem is? It took me weigh too long to find out. 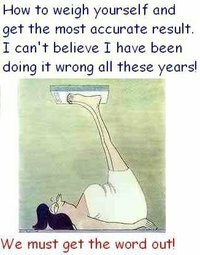 I found it on Facebook, and I made it my profile photo – I thought that it’s good for people to see that I do exercise; I do weigh(ing scales) lifting, and I finally know how to read the sweetie. LOL!!! It is sooooo funny!!!! I laughed out loud when I first saw this. It still makes me giggle. Yes, it’s a huge relief isn’t it? I am hoping to apply this sort of logic to other problems in life too. I am sure there are equally simple solutions to all the thorny problems I face each day.